Nose: Herbal, dry with dried flower and leaf notes. Palate: Peppery, spicy with a hint of sweet coffee, caramel and cinnamon. The finish is zesty, grassy, spicy and oak flavored. Pioneering the concept of single barrel Cognacs, this maison deliver the Comandon Vintage Single Cask 2012 Grande Champagne Cognac. They are known for going against the status quo by selecting one barrel from one year, or one terroir. In this case, they have selected a Vintage Cognac from the Premier Cru. It is mature with a smooth finish, and defies any notions about younger Cognacs having less character. This Cognac has a particularly fruity and vanilla profile. It is aged in French oak barrels that have been lightly toasted and used previously to age and mature Cognac. While the color may appear to be lighter than a typical bottle of Cognac, this adds to their personality. Non-stereotyping is the essence of the Comandon Single Cask 2012 Grande Champagne Cognac, and offers a more modern approach to tasting a fine spirit that is steeped in tradition. Instead, the idea of a ‘single cask’ is more often found in the whisky and bourbon arena. 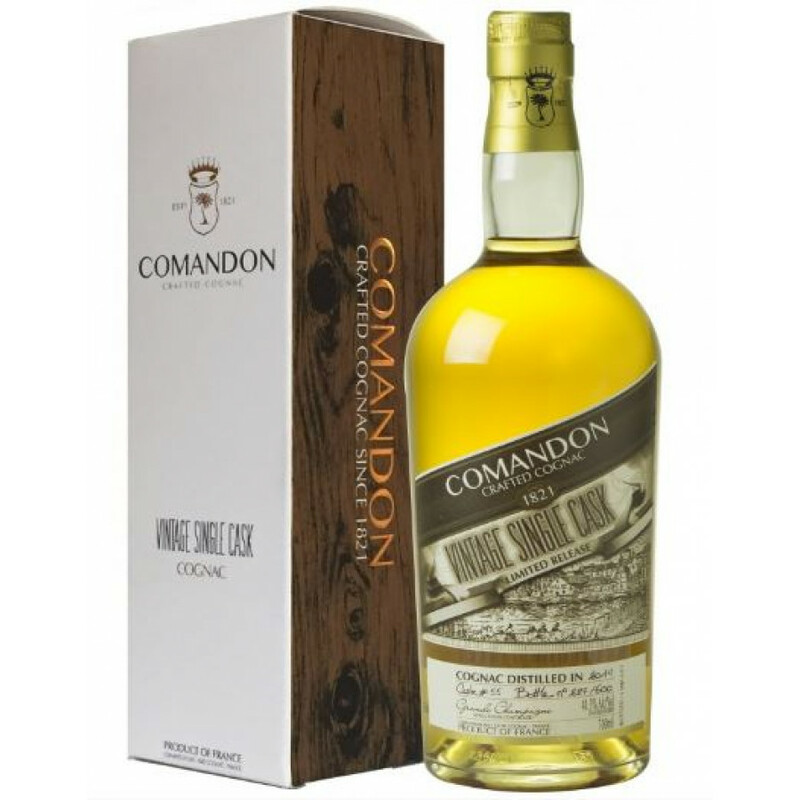 Comandon have selected the Grande Champagne to craft this particular Cognac. Known for its chalky soil content and maritime climate, it produces fantastic eaux-de-vie with a lengthy finish. A wonderful Vintage Cognac for the curious, and who are looking for something diverse with a bright taste. This Cognac house do not believe in striving to achieve the same eaux-de-vie time and time again; instead, they craft one-of-a-kind Cognacs. Once it’s drunk, that’s it - this single cask from 2012 yields 600 bottles only. Patrick and Franck Vigneron scrupulously review every barrel and hand select less than 1% of their Cognacs for bottling. No caramel colorings, sugar or flavorings are added and they generally bottle at cask strength. Filtrations are limited prior to bottling, and reserve cold filtrations are reserved for particular markets where cloudiness in the bottle is not tolerated. A classic bottle, with a wonderful graphic illustration of the Comandon estate in the heart of the Cognac region. It also comes in a stylish presentation sleeve.